This Blog Post is Brought to You by the Number 3! Happy 3rd Birthday Gaia Magick Photography! Category: Extra Stuff, special promotions, what's going on this month? 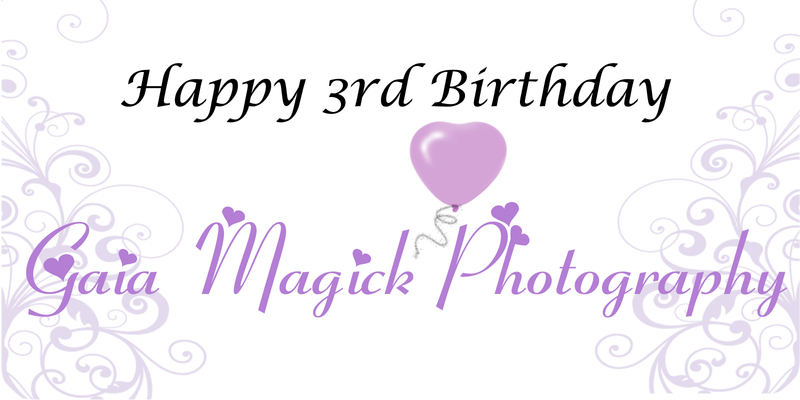 On April 1st Gaia Magick Photography officially turned 3. For three beautifully exciting years I have been photographing woman of all ages, shapes, sizes, personalities and comfort levels. It has been three wonderful years of meeting fabulous woman, learning new skills, and expanding and exploring my own creativity. I’ve made some fabulous new friends and created some amazing costumes for you ladies. And I’ve had the honour to touch the lives of the woman who have come into my studio to be photographed and created thousands of bold gorgeous fun images for those bold woman. To celebrate this occasion and to say thank you for the last three years Gaia Magick is offering you 3 birthday specials for the month of April. Sessions completed during the month of April can take advantage of these three special offers. If you want to you can use all the special deals in the same ordering session! Are you ready for some bold gorgeous fun? Interested in taking advantage of the birthday special? Do you want to celebrate yourself, or an accomplishment (big or small!)? Do you want to create a unique gift for your someone special? Do you need a little more information or, perhaps, help coming up with a creative inspiration that truly brings out your inner goddess, please contact me right now. I’d love to chat with you! Cheers to anther 3 years of bold gorgeous fun with amazing woman like you.